As I am sure you are all aware the weather in Ireland this summer was plain & simple CRAP and the knock on effect of this is far more than a reduction in vitamin D!! 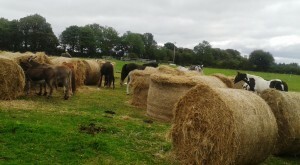 As a rescue with 34 hay eaters we can tell you that we are worried about the feeding season ahead due to the poor summer, we are already aware that hay is not going to be as plentiful, of as good a quality or price as last year and as a result we need to raise more general donations and money from our hay appeal draw than ever before. To keep you all apprised on our progress for funding each month’s hay we are introducing a “hay”o”meter” which will show you how much we have raised towards the next hay order. You can see donations made through Paypal raise the level of the thermometer in a few minutes but donations through iDonate will have to be added by us manually each night so will not show straight away. So we know your donation is for hay please state this when making your donation. We have said it before and will say it again “it is only with your generous support that we are able to continue helping those who need assistance”. Whereby we do not ‘announce’ the arrival of new equines to the rescue on a regular basis this is not because we are not helping when & where we can. As a rescue we predominantly deal with neglect, abandoned and/or cruelty which means that we cannot post photos or share it’s story because then any chance we would have at taking a case against an owner is thwarted. Unfortunately not being able to publicise new arrivals such as these can lead to people thinking we are not actively rescuing and this in turn results in reduced support around fundraising.